Technological innovation keeps industries competitive, providing financial gains, jobs and national security. The announcement of a number of strategic initiatives that prioritise support for R&D in particular technical domains has demonstrated the commitment a number of governments have to supporting technological innovation. Such initiatives include the Eight Great Technologies in the UK and the Key Enabling Technologies programme in the EU. These programmes support a range of technologies, some of which support further innovation. Understanding the different types of technology can help government better target R&D investment. This briefing note focuses on the different types of technologies which can be supported to increase the likelihood of, and hasten, technological innovation. It provides a framework that can be used to conceptualise these different technologies and some of its implications and concludes with a selection of remarks on the implications specific to public policy. 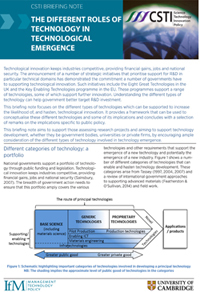 This briefing note aims to support those assessing research projects and aiming to support technology development, whether they be government bodies, universities or private firms, by encouraging ample consideration of the different types of technology involved in technology emergence.